The 2019 Honda Civic sedan arrives with an impressive inventory of technological systems and available options. Visit our new and used Honda dealership near Alice, Georgia to see the Honda Satellite-Linked Navigation System™ in action. During your visit, be sure to ask about the Multi-Angle Rearview Camera. Cruise to work in new compact sedan today, visit Shottenkirk Honda of Cartersville! Looking for a sporty ride to get you to work on time? You just found it. Climb into a 2019 Civic EX to command a 1.5-Liter turbocharged engine. Opt for the Civic Sport to blip through the gears on the available CVT transmission with Paddle Shifters. Snag your 2019 Honda Civic sedan at our nearby Honda dealer. If you like the drive of a manual transmission, row through six speeds on the 2019 Civic LX. Head to our new Honda dealer today. Audiophiles will love the available 10-Speaker Premium Audio System. 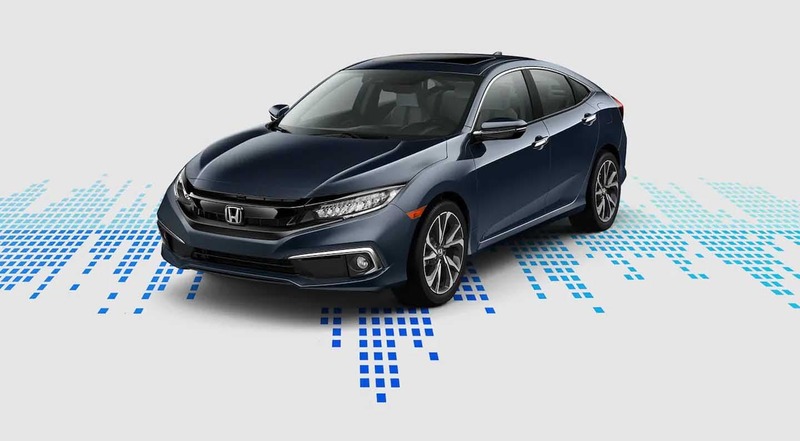 Thanks to the HondaLink® system and Pandora® compatibility, you can customize the score of your drive with your favorite music, audiobooks, and more. Visit our new and used Honda dealership to learn which new Honda models come standard with Apple CarPlay™ and Android Auto™! The 2019 Honda Civic sedan offers both cloth and leather interior options. Looking for Heated Rear Outboard Seats? Take a spin in the Civic Touring model. The Leather-Wrapped Steering Wheel and Shift Knob in the Civic Sport give the driver a luxurious ride through Calhoun, Georgia. The 8-Way Power Driver's Seat also helps on those long road trips. Honda Sensing® is a package of advanced driver-assist systems to help keep you safe. Notable components include a Collision Mitigation Braking System™, Road Departure Mitigation System, Adaptive Cruise Control with Low-Speed Follow, and Lane Keeping Assist System. The road you drove yesterday isn't the same road today. Honda helps you avoid the unexpected.